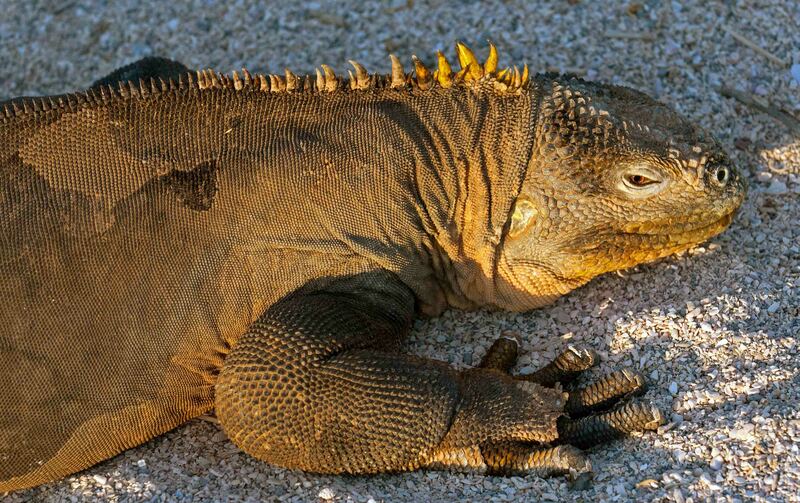 There are 44 species of iguanas (in nine genera), but remarkably, some are still undescribed (1). 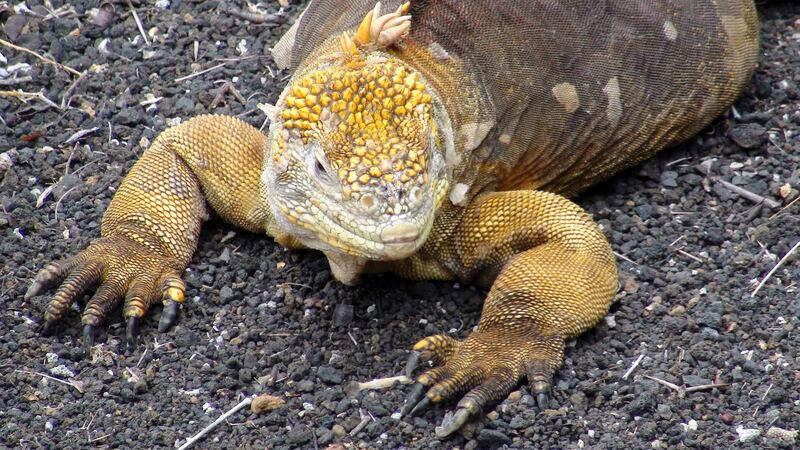 There are three Land iguanas found in The Galápagos Islands: Conolophus marthae, Conolophus pallidus and Conolophus subcristatus. The commonest one, C. subcristatus, is found on about seven islands, including North Seymour, where these pictures were taken. I was not fortunate enough to come across the other two species, the yellow and pink species. Amazingly, the Galápagos pink land iguana, a relic lineage dating back over 5 million years, remained unseen – lurking on Volcan Wolf (the northernmost volcano in Isabela) – until it was “accidentally seen” by some Galápagos National Park rangers in 1986 (2). Although they play second fiddle to their more illustrious cousins, the marine iguanas, land iguanas are in some ways more impressive. They can grow quite large – it varies depending on which island they live on – to over a metre in length and weighing up to 13 kg. They mostly feed on prickly pear cacti (Opuntia) although they also take a range of invertebrates and carrion (hopefully not tourists!). We have not been very kind to land iguanas. Man introduced goats (which ate their food) and dogs and cats (which killed them); soldiers also used them for target practice. They have, as a consequence been decimated in number, and native populations on two islands have been lost. 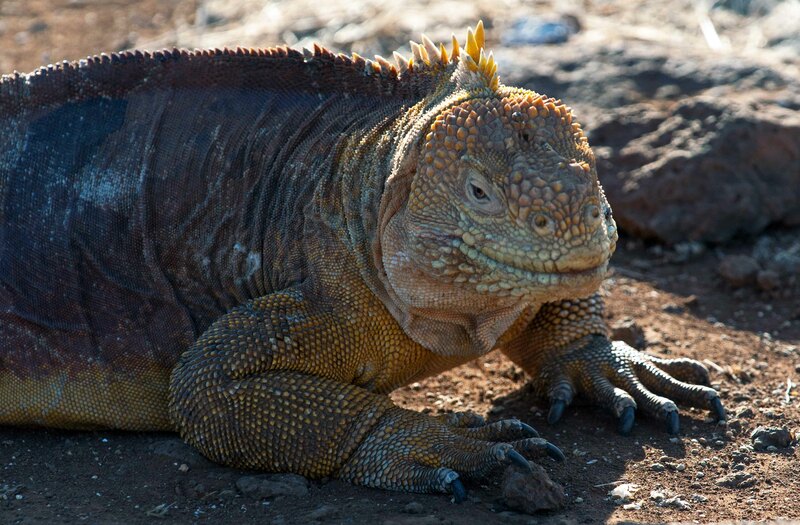 Despite all these trials and tribulations, there are estimated to be still between 5,000 and 10,000 land iguanas remaining on The Galápagos Islands and according to the Galapagos Conservancy (GC) “all of the populations appear to be healthy” (3). Land iguana (Conolophus subcristatus) Galapagos captive bred. These wonderful creatures deserve our respect and protection. Like marine iguanas, they can live for a long time (over 50 years), and have been present on these island for many millions of years. Indeed, it is thought that they diverged from the marine iguanas about 10 million years ago (long before the present islands even existed!). Next Next post: The Common Earl, a butterfly with green eyes!